Where else but in vintage wear can you look all prim and classy while also feeling as comfy and easy to move in as if in casual clothes? 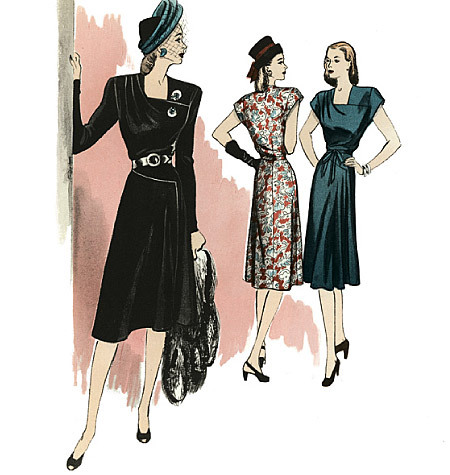 The 1920’s, 30’s, and 40’s had mastered the use of pleats, godets, bias cuts, and the like to make clothes styled well and also move nicely, keeping up with a modern woman’s busy life. Here I’m getting down to deep, rich earth tones in a “down to earth” outfit of easy to make, effortless to wear early 40’s pieces. 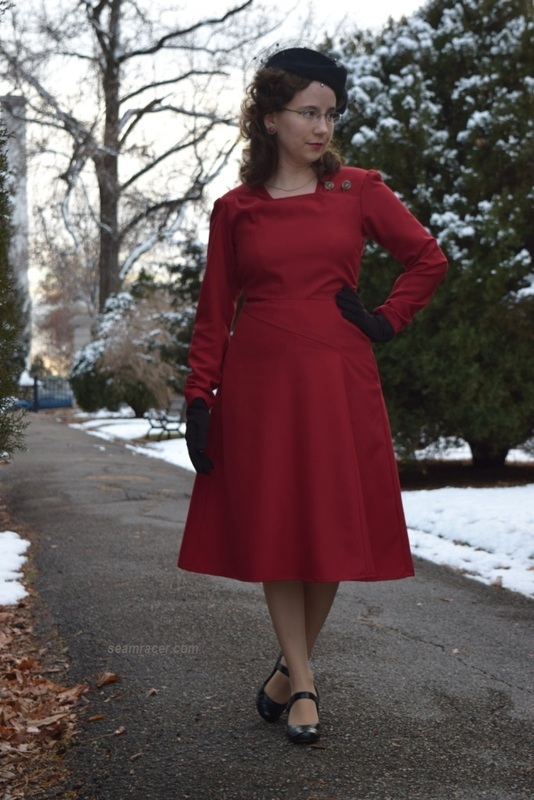 This is the first post which is officially part of my “Agent Carter” Sew Along. 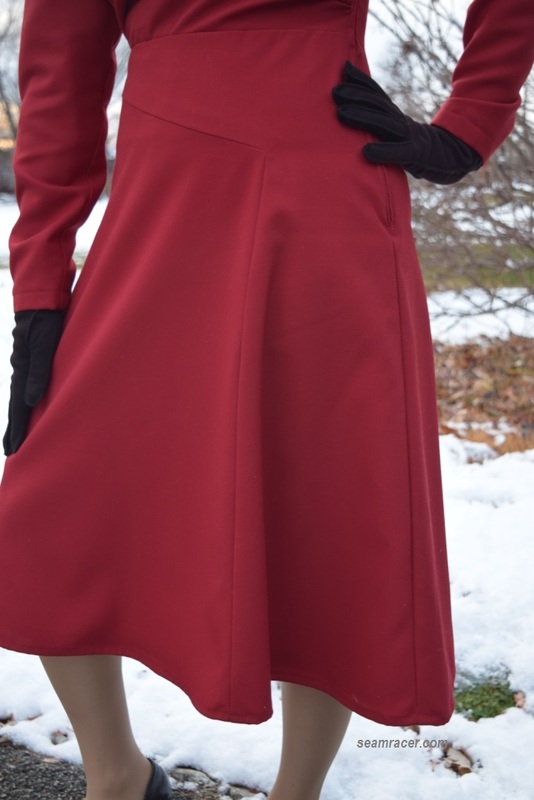 I feel this is a perfect “Agent Carter” inspired clothing set. It is a mix of two of her style tendencies. She often wears wonderfully tailored blouses in deep colors, with collars so beautiful I always sigh when I see them. Although she is not afraid to stand out, she is also leading a secret life as an SSR (Strategic Scientific Reserve) agent, so she also tends towards nondescript, often neutral separates. Let’s think of charcoal grey with lavender or dark brown with pink. However, working in a man’s world, she needs a feminine touch. 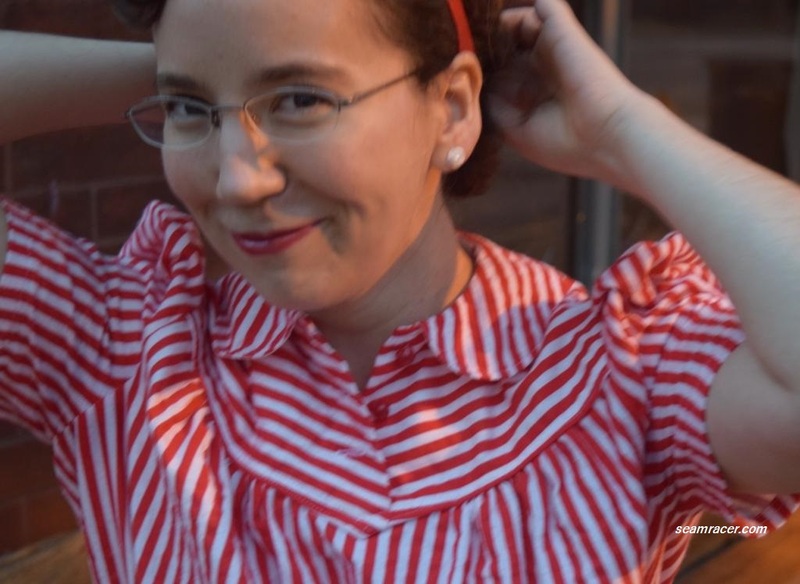 Finding that perfect blend of both can be challenging and fun, but I think if it can be actualized for your wearing, it is generally flattering and also classic of the 40’s era. 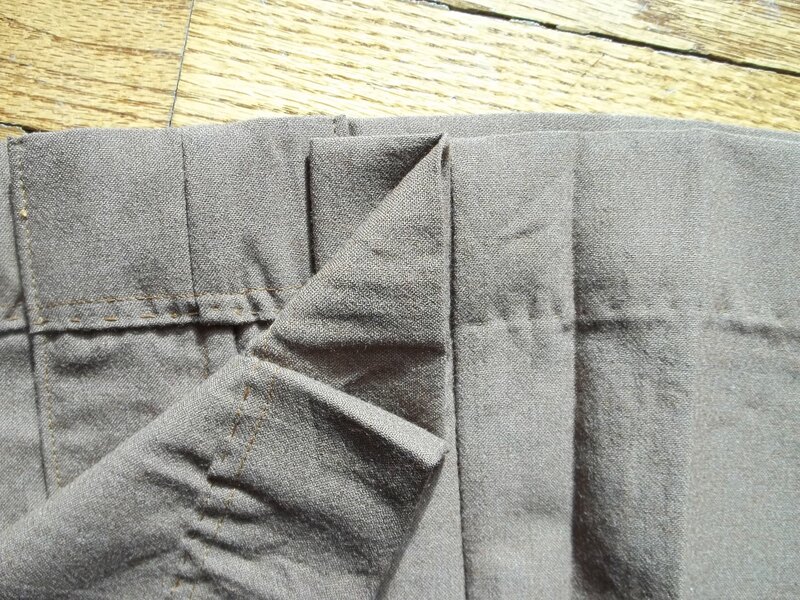 FABRIC: For my skirt, I used a very fine, medium weight, 100% wool twill. It is a tan/brown color that is slightly heathered in bits of grey and cream. The blouse is made out of a lightweight 100% cotton broadcloth which just seems to get softer at each washing. PATTERNS: Simplicity #3961 was used for the wool skirt. 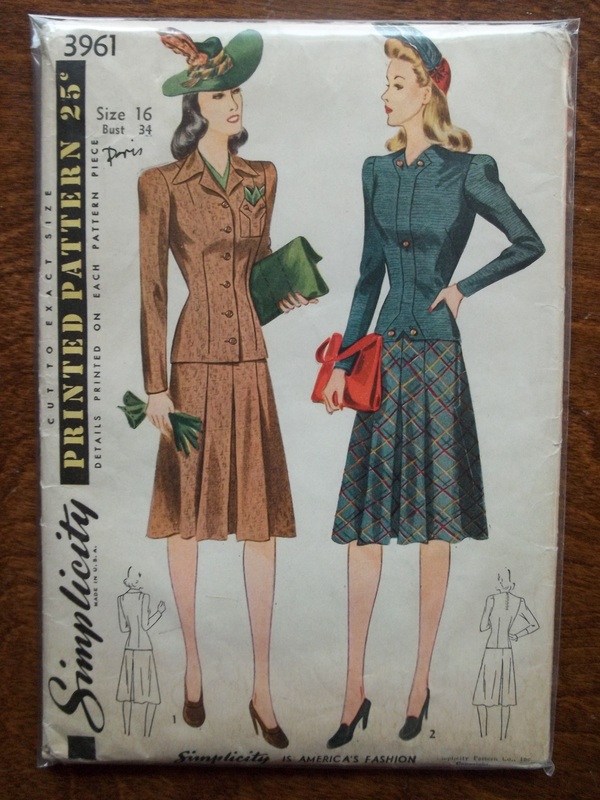 #3961 is a year 1941 suit and skirt set with the option of two different top halves – either a jacket or a blouse. I used Simplicity #4602 from the year 1943 for the cranberry cotton blouse. TIME TO COMPLETE: My blouse was completed in 6 to 8 hours and was finished on January 18, 2015. 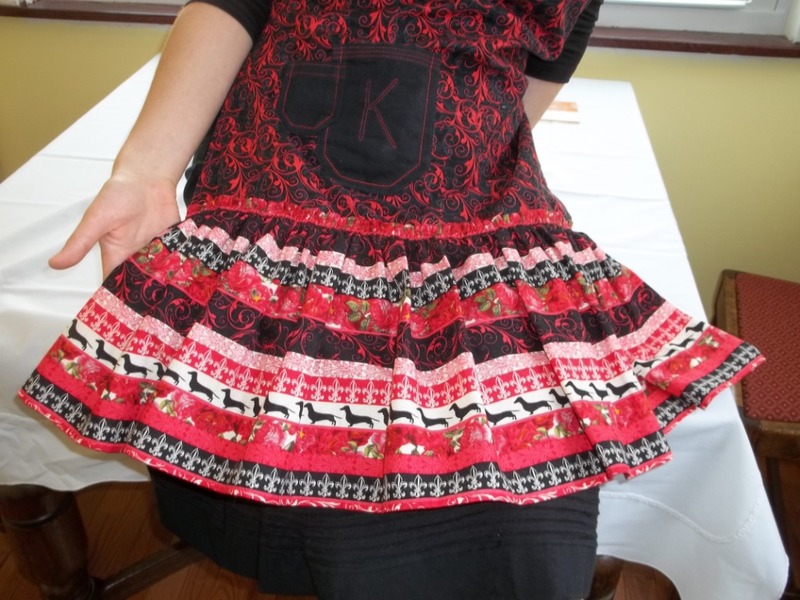 The skirt was made in 5 or 6 hours (start to finish), and was done on January 26, 2015. THE INSIDES: Every seam of both the blouse and the skirt, excepting the hems of course and the blouse’s shoulder seams, is done in French seams for a clean and couture finished look inside and out. TOTAL COST: The fabrics for this outfit were bought at Hancock Fabrics on a deep discount. The total cost for the 2 yards I needed for the skirt came to $4.60, while the total cost for the blouse was about $4.00. I did buy a zipper for the skirt side closure, but it was purchased maybe half a year ago and I normally pay under $1, so I’m not really counting this as well. In other words, I suppose total for the set is just under $9.00. There’s not too much to say about my blouse except that I absolutely love everything about it. 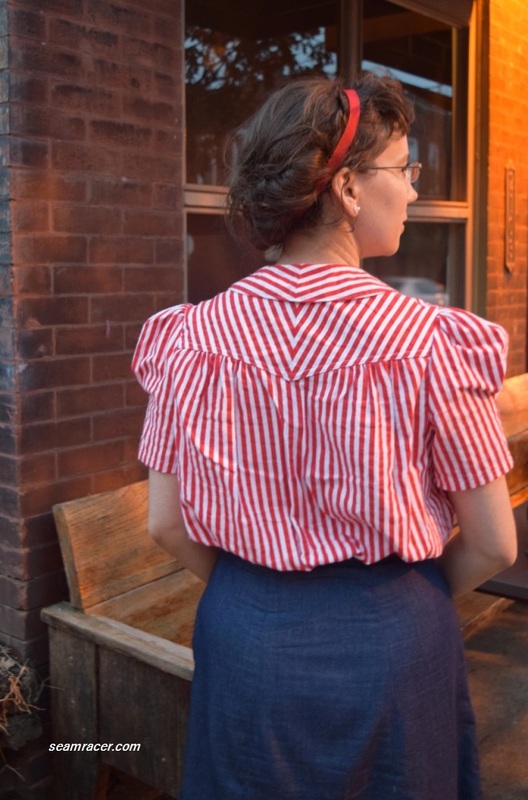 This is the second time I have made this blouse (you can see my first version here and here), and this time I made sure to take the time to have this pattern last for many more years so it can become my standby 40’s blouse pattern. The pattern itself is on unprinted tissue, and has slight water damage, making it fragile and brittle. 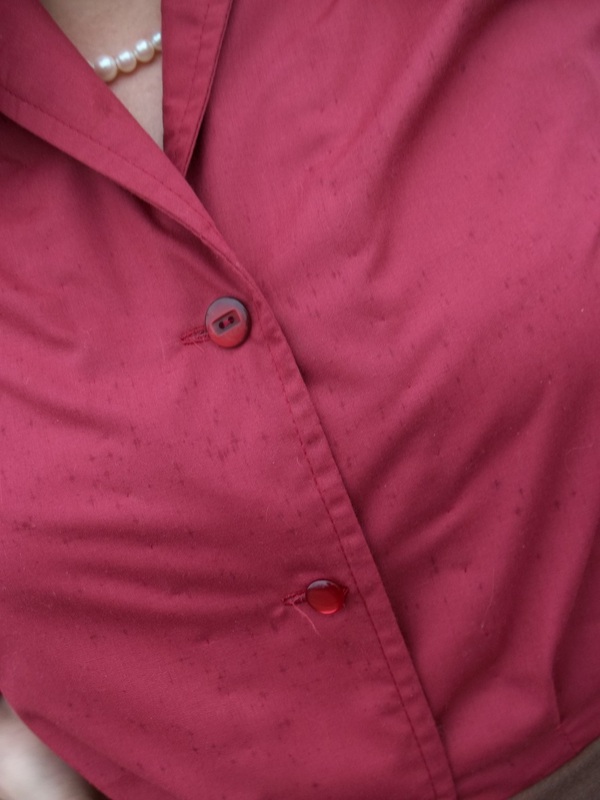 I was able to use it “as is” for my first blouse, adding on the fitting adjustments where needed and making thorough notes so as to repeat what I had done for a perfect fit. However, some slight tears in the paper were inevitable, so…this time I traced out a brand new paper copy of the blouse with all markings transferred and my personal fitting needs added on to become part of the pattern. 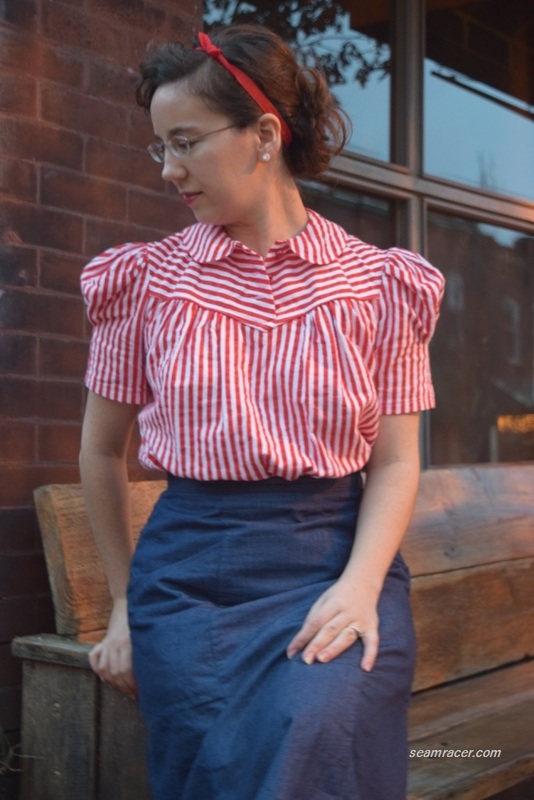 I love the fact that this blouse has the collar in-one with the blouse and facing (there isn’t a separate piece to sew on) because this always seems to make this blouse very quick, easy, and fun to whip up. Now that I have a custom paper copy, creating Simplicity 4602’s blouse should be easier than ever. Secondly, the blouse has the very flattering and very classic forward shoulder seam, with gathers where the front panels meet to create soft gathers for subtle bust shaping. The darts to shape the hips and waist are curved in such a way that they make the blouse have almost a peplum look when it’s not tucked in, and also minimizes too much excess blouse to tuck in like some other blouses. (Don’t you hate when there’s too much bottom fabric to a blouse to tuck in a snug fitting skirt and it looks funny? I do.) As is usual for my blouses, I finished the cuffs of my cranberry cotton top in two pairs of 5/8 inch button holes, so I can close the cuffs using cufflinks. I hate to be a bore or seem too predictable, but look for yet more versions of this blouse to come. I’m contemplating adding an interesting pocket to the front of my next Simplicity 4602 blouse. It really can’t get any better once you find that perfect vintage top pattern which gives you all the comfort of modern “play” clothes in classy past style. No kidding, I totally have room to do anything in this set – swing at the playground with my little one, look nice at a restaurant, or even do some Peggy Carter’s athletic “good-girl-taking-out-the-bad-guys” type of moves. You see my feeble attempt at re-creating “the tiger”…I suppose it shows how much I like watching ‘karate/kung fu’ movies. The skirt was easy but slightly hard for me at the same time. Confused? Well, I am a very precise type of person, to the point of making things hard on myself. This skirt put my precise skills to the test. 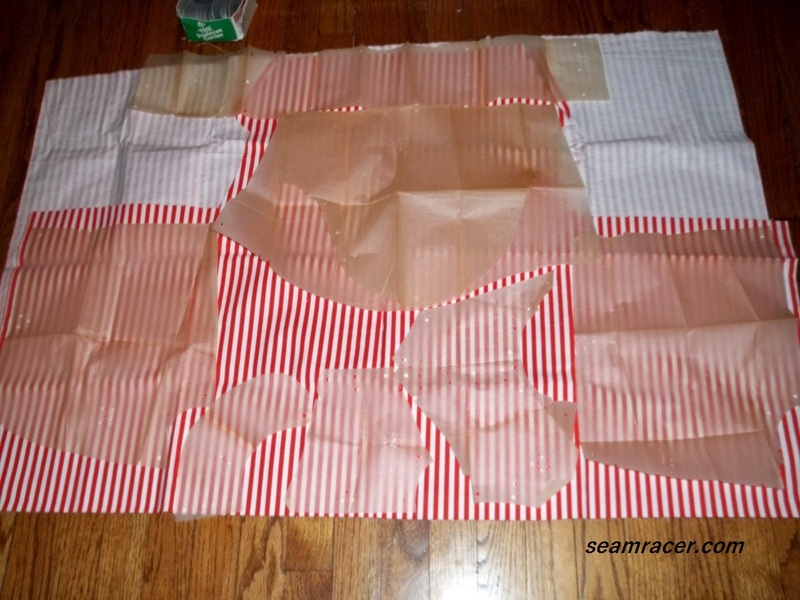 Even though it looks easy on the pattern envelope back (hey, there’s only two tissue pieces, as you cut two of the back and two of the back), I was very exact with marking the dots of where to fold the pleats. The front has a center box pleat and a regular pleat on each side while the back has a simple center box pleat. 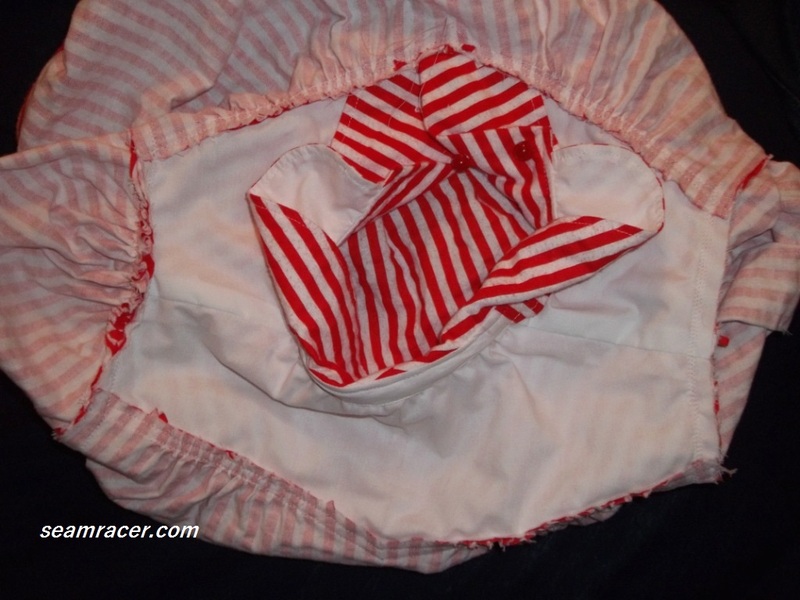 You fold the box pleats in so as to meet at the center seams of the back and front for relatively easy matching. 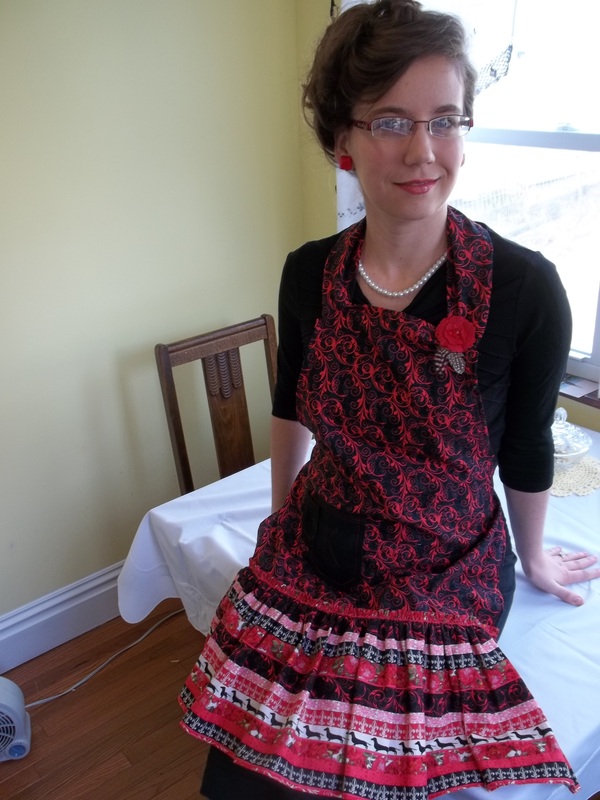 I did not sew down the edges of the folds, like for this basic black 30’s skirt, but I did obsess over making the pleats permanent and even all the way down to the hem when I did my final ironing. 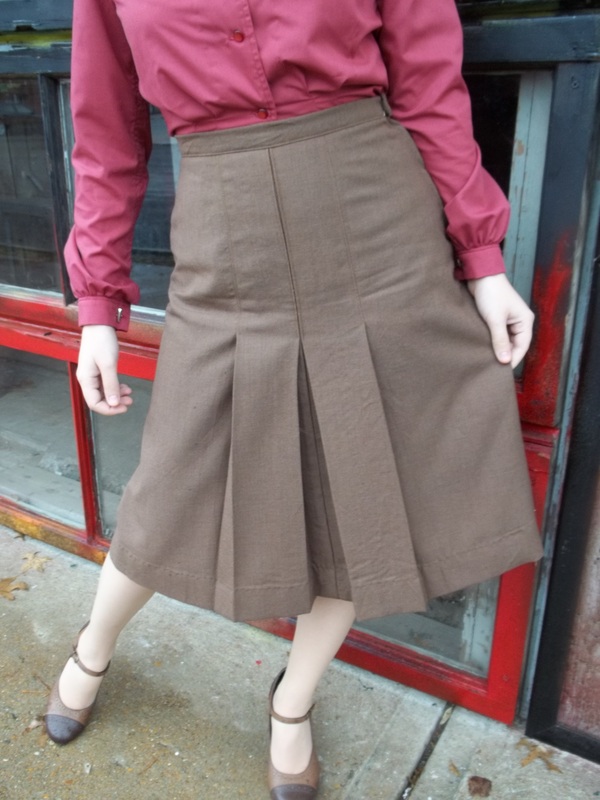 For some strange reason, I have found in my sewing experience to notice that many 1940’s pants and skirts seem to run slightly smaller than the size shown. Thus, I often forget but need to remember to give myself and extra inch above what seems necessary to reach a comfortable fit. 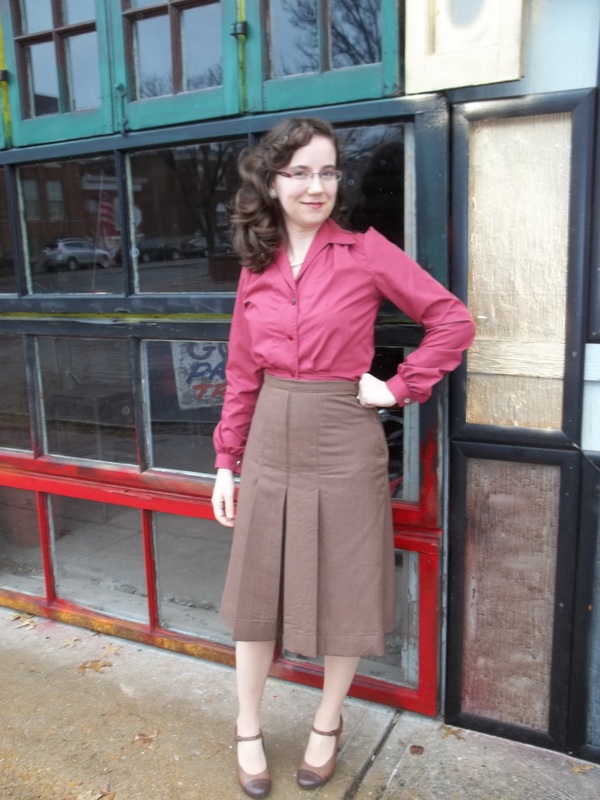 The 1941 suit pattern I used for my skirt is actually too big for my sizing but turned out fitting just right for me. Many vintage patterns also call for deep hems, as well, although the widest hems I’ve seen come from 1920’s patterns (see my 1928 dress – it has a 5 inch hem). This skirt pattern called for a 2 inch hem, but to fall at the proper length on my body, I needed to make a wide 3 1/2 inch hem. I hand-stitched down the hem, after measuring and ironing the hem in place, to have an invisible finish. Wide hems can be quite nice, almost like weighing down the whole garment slightly in a way that keeps it in its place. 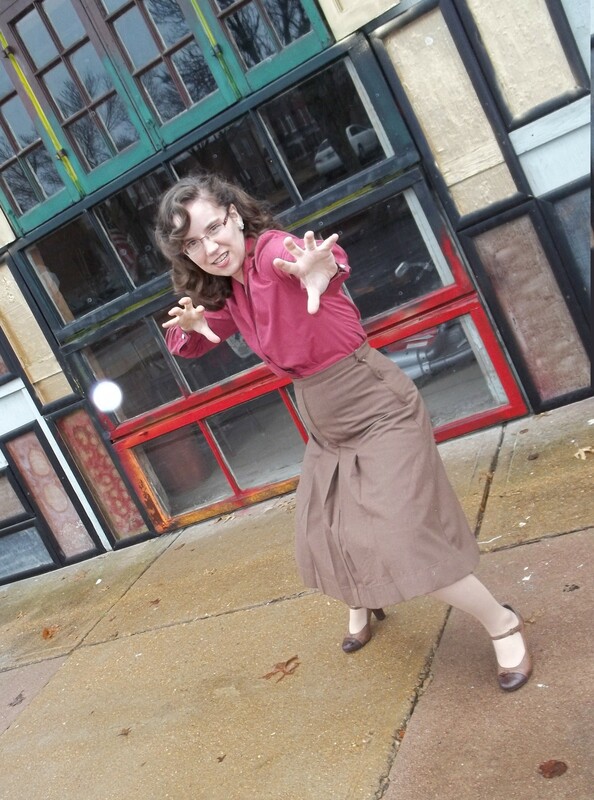 Hey, hey, look in the above picture – I pulled out my favorite “made in Italy” vintage seamed stockings for this outfit. 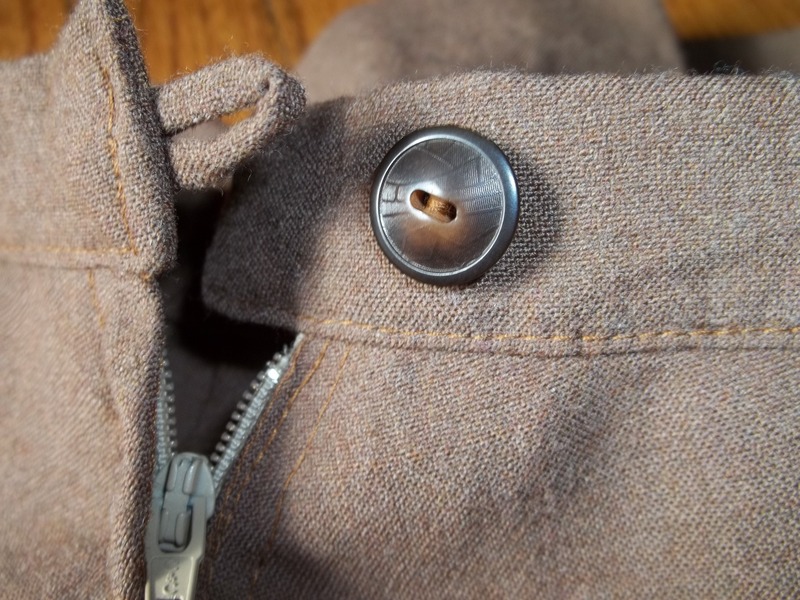 Waistband closure ends are often quite thick and bulky, so most of times I do not attempt a button hole. 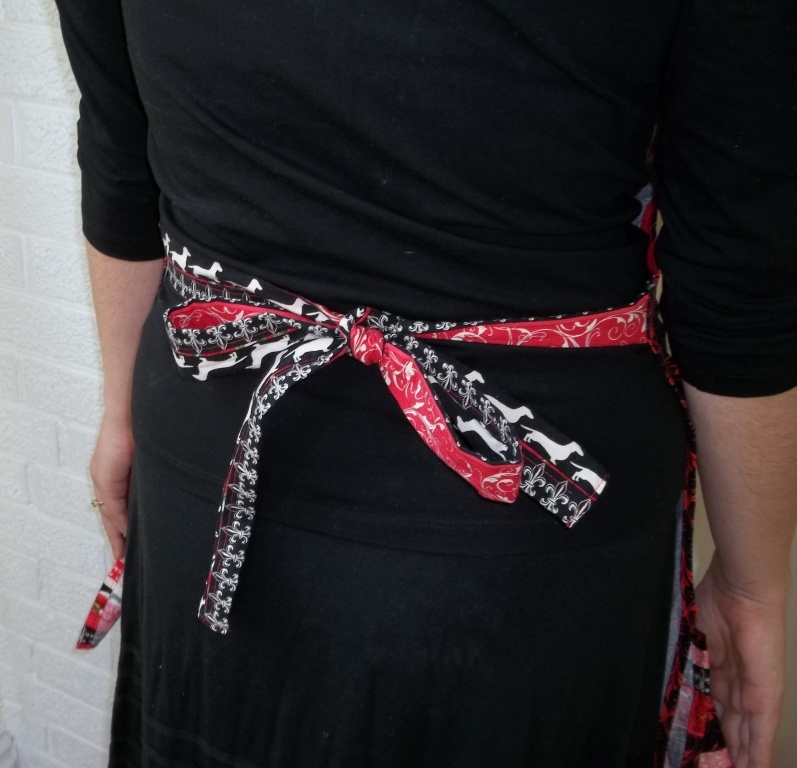 I like to use large, sliding-style, waistband hook-and-eyes most of the time, but for this skirt I chose to add on a loop and button closure method. Maybe I like to add loops merely because I enjoy making those tiny bias loops. Anyway, the waistband button is neat, unique, and highly detailed, also from Grandmother’s stash of notions. I hope you can see the tiny grooves and swirling design, like veins, and the two different brown/tan tones of the material. Both my blouse and my skirt are an unintended outfit. Both my blouse and my skirt were actually made to go with other pieces. My wool skirt is the bottom half of the full suit. I am in the middle of making the suit blouse from the Simplicity 3961 pattern, using a rich forest green wool crepe. The cranberry blouse is meant to match with a wool tweed, in a grey and white, green and cranberry plaid, to be made into a war-time jumper from a mail-order pattern. However, a 40’s gal would not have made clothing pieces that did not completely integrate into the rest of their wardrobe, so I suppose I did things the right way with my separates. I still have several yards’ worth of my skirt’s wool twill to make a man’s 1939 coat/large pocket shirt pattern, so my hubby can have more handmade vintage wear, too! Do you have any earth toned 1940’s creations? 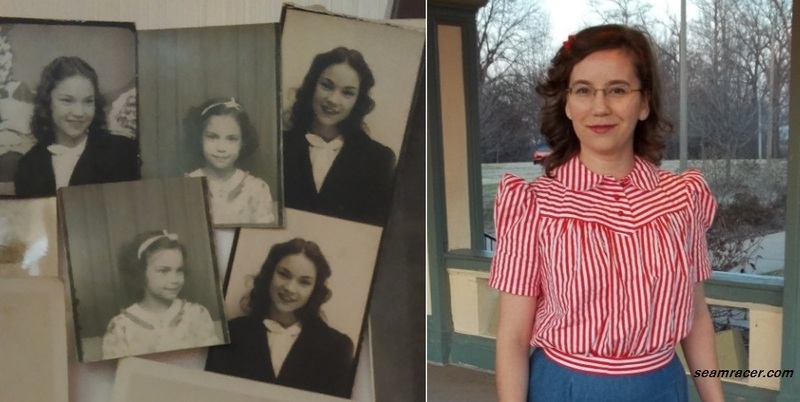 Have you done (or are inspired to do) any sewing in my outfit’s similar colors or fabrics, maybe even something in wool-look alike fabric, or in a blend of the feminine and masculine touch, like Peggy? Are you envious like me of Miss Carter’s amazing agility? 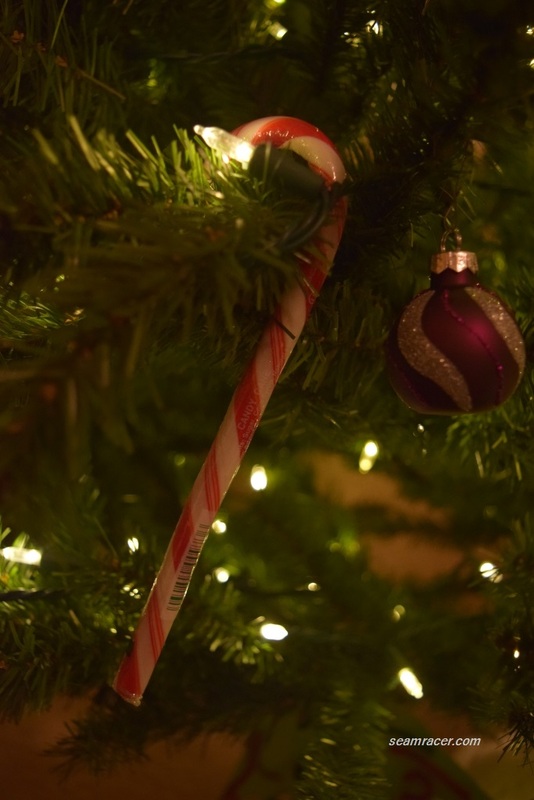 This Christmas, I celebrated the season in style – handmade vintage style to be exact. My finished dress in one of my #1 best made project so far, taking into account the high quality fabric and details which are involved. My best 1940’s hat, complete with pristine condition feathers, rhinestones, and netting, was worn to suit posing in my new fancy dress. FABRIC: The dress is made using a 100% wool medium weight gabardine, with an excellent soft drape. It is in a deep, royal red color. I believe I bought it at a JoAnn’s store, back in 2011. Wool gabardine is a very rare find in the stores of this town, so when I saw this fabric (the only bolt of its kind, all sad and lonely) I picked up over 3 yards of such a prized find. After my dress, I still had a nice 3/4 yard chunk of this fabric leftover to go towards cutting some better fitting sleeves. 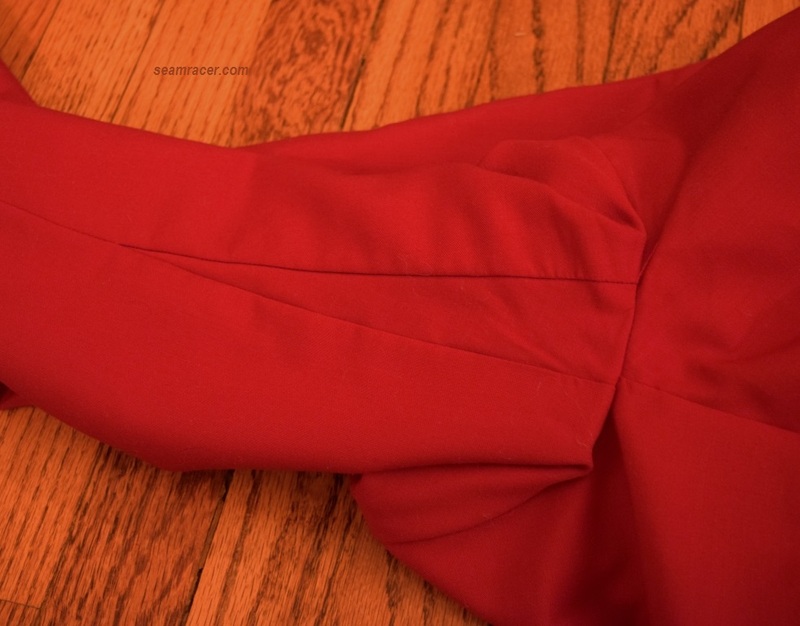 The lining for my dress is a basic red cling-free poly lining, bought just before making the dress. NOTIONS: I had to buy most all of the notions for this dress because I wanted to be very specific with the finished look. I bought matching thread (Mettler Metrosheen and a Dual duty), a side zipper, and buttons for the wrist closures which matched the big buttons I already had for the bodice closure. 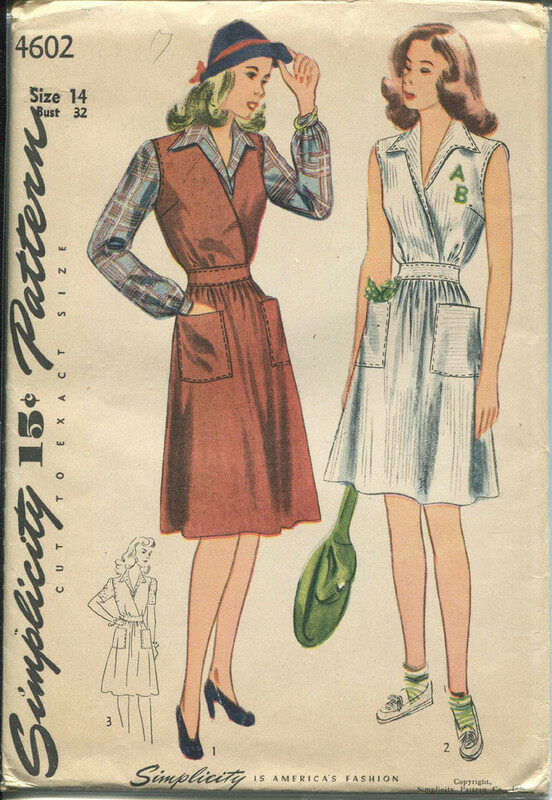 PATTERN: “Retro” Butterick #5281, a reprint of an original year 1946 no. 3935 pattern. Even though Butterick released this pattern back in 2008, I believe it’s still in circulation. TIME TO COMPLETE: Oh my! Too long for my taste. I probably spent more than 30 hours to make this dress over the course of 2 weeks. It was finally finished on December 19, 2013. Later, In December of 2017 I came back and gave this dress the better fitting and detailing it deserved. FIRST WORN: to my maternal side of the family get-together, the Sunday before Christmas. It is held at a historic German building, now a restaurant, and I think my bright red dress matched the festive, old-world style decorations inside. Boo hoo, it was too dark inside for any pictures of the place. TOTAL COST: I’m not that sure, but it probably is a bit over $30. That is more than my normal cost, but worth it in the end. Don’t forget, the total cost was mostly spent 3 years ago anyway. As I usually do, I checked plenty of reviews from other seamstresses who have made this same reprint, and I ended up just getting all around confused. 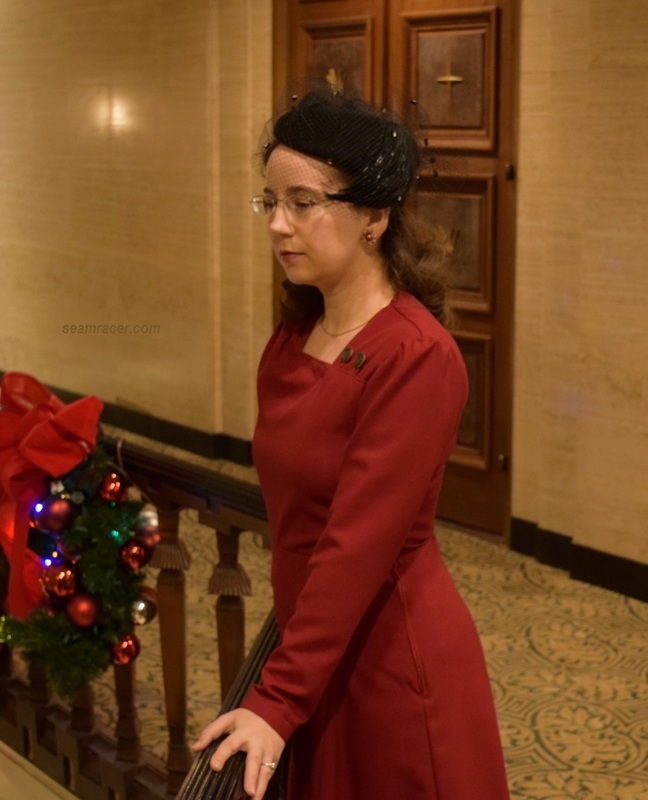 So many others have made this dress and none of them were really consistent with any one problem, but more than one mention of tight sleeves, generous bust ease, and difficult neckline pleats perked my attention. Looking ahead for these traits, I covered my behind (ahem…) by adapting some of the construction while slightly changing just a few of this dress’ details. 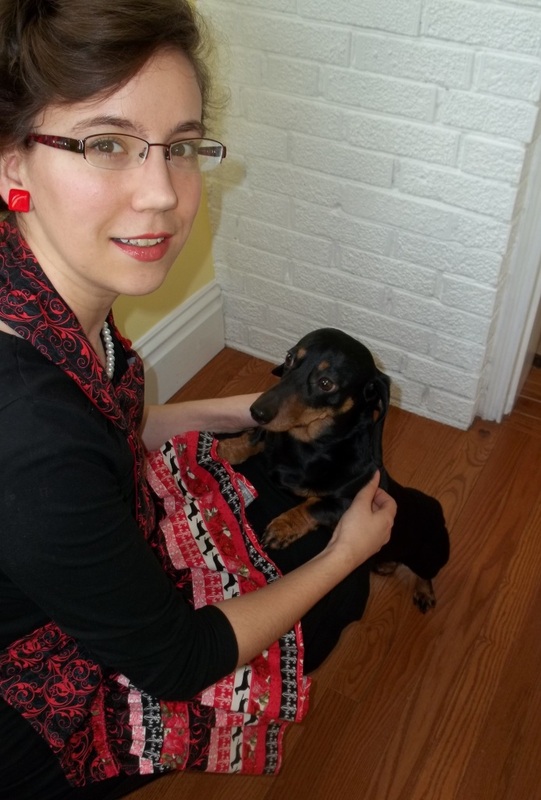 I wanted my dress to be quite close to the original, and similar to the model on the Butterick web page (at left). I’m hoping my small variations to B5281 make it so much more elegant and practical. I tried to fit this dress better when it was still at the cutting stage by doing my now normal wild grading technique. My front bodice is an 8 graded at waist to a 10, my back bodice is a 10 graded to a 12 at waist, the skirt half is a solid 12, while the sleeves are a 10. Crazy isn’t it…but, hey, it has always worked great so far. However this dress still doesn’t fit quite right, even after coming back and re-adjusting it, so I’m chalking my problems to a very poor reprint of a vintage original. The first big change to the construction process was to sew the lining and the dress together as one. 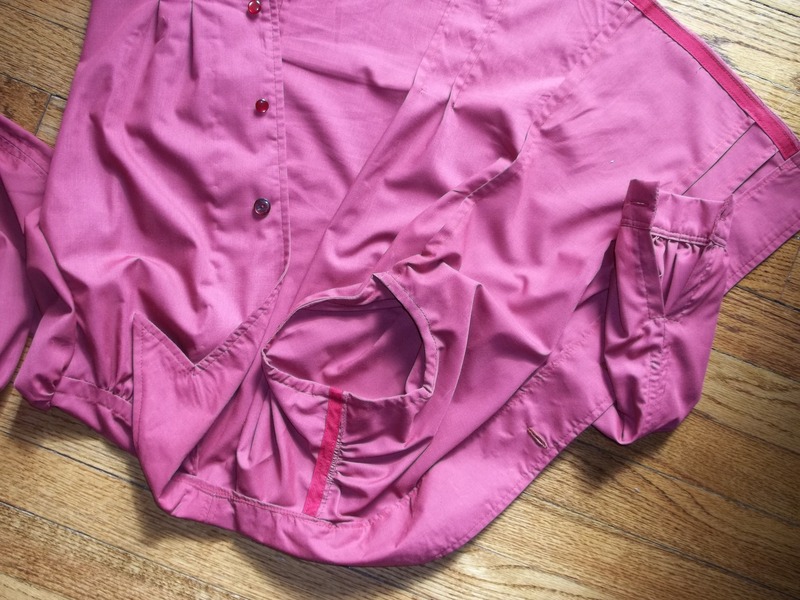 This way if any fitting adjustments are needed, such as to the shoulders or sleeves or darts, I can fix issues without a headache of unpicking. The bodice front, with its lining having a separate fit with darts, and the skirt portion, which is hanging free from the waist down, are the only exceptions. To have the lining fit over the inside of this dress like a separate 2nd glove sounds nice, but I’ve done dresses like that before, and had my share of grief from that design, so I wasn’t ready for that with this dress. 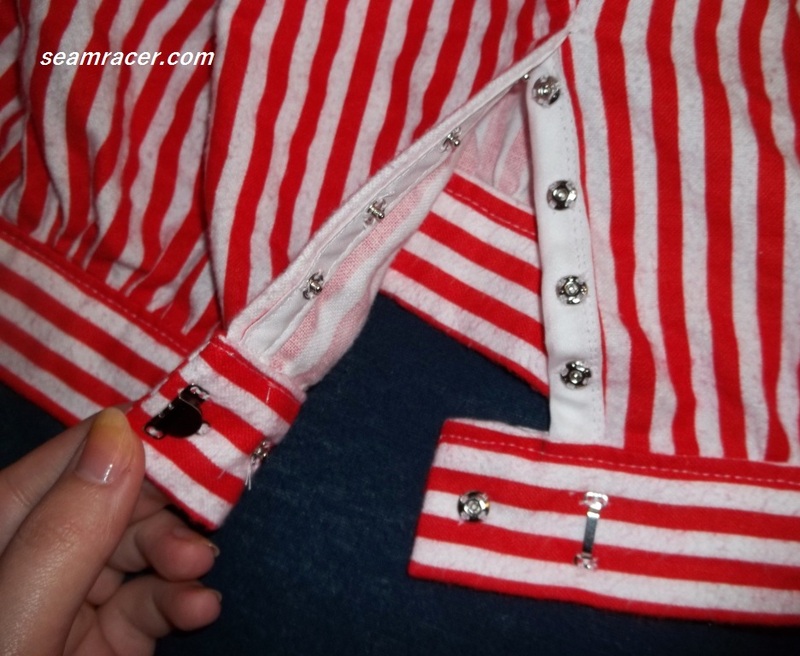 Besides, I have my own favorite way of making my handmade clothes look professional – French seams! 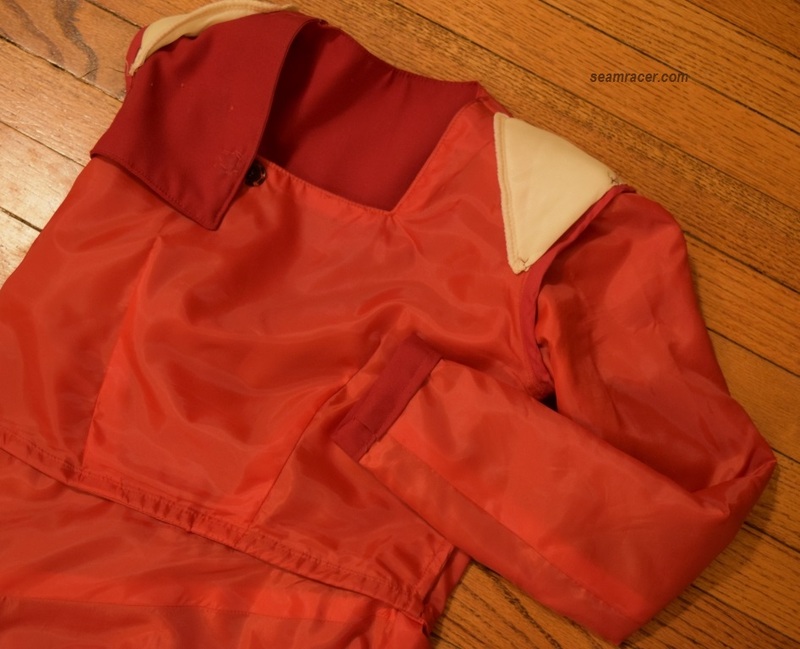 Every seam is French seams, except for the bottom hem and flat felled seams inside the sleeves. See ‘inside out’ picture at right. I didn’t have any problems with the side neckline pleats, but I completely understand how easy it could be to totally mess up. Those three little neckline details are awfully close to some seams and are a bit slanted, too. The neckline shape of my dress happily turned into an inverted rectangular shape according to the pattern – a few bloggers complained their versions of B5281 became an exact square neckline, for some reason. Just make sure not to let the gathers at the end of the pleats get bunched into or pull at the neckline seam. I even added seam tape into the whole neckline and shoulders to make sure everything keeps a perfect shape. 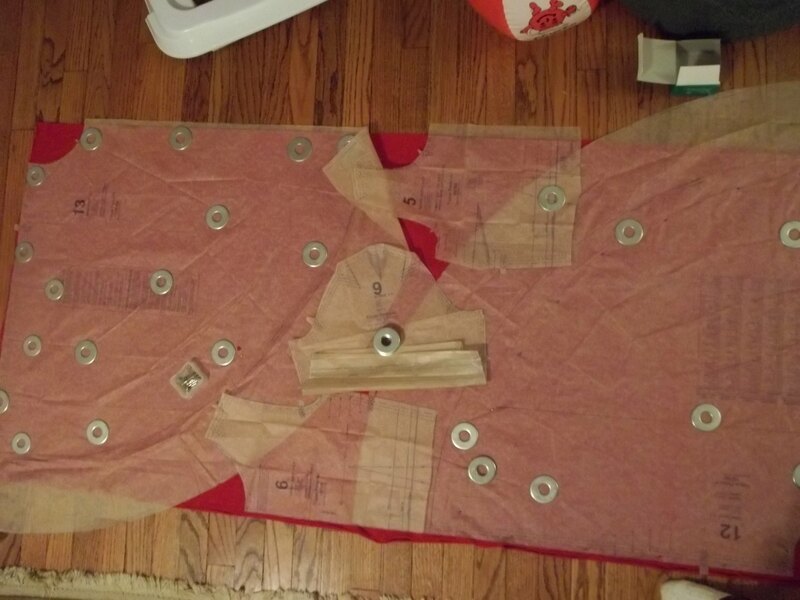 My very best, red letter recommendation is to PLEASE do all the markings, transfer them precisely, and sew directly on them without any cutting of ANY corners until you’ve made sure it’s alright. Taking your time and being as precise as you can be will basically assure those details turn out the same as the pattern. Be warned, though, the bodice alone did take up about half of my whole working time on this dress. Also, the fullness to side shoulder pleats really don’t blend in that well with the rest of the dress as the cover drawing led me to believe. Now, not that I am against pure decorative purposed items, but why add buttons across the side bodice closure and have them do nothing?! I couldn’t do that. So I cut some bias strips to sew my own tiny tubing to use as loop closure, and added them into the front seam at exactly 1 1/2 inches away from the side seams. Voila! Only one heavy duty snap was needed to be hand sewn to the inside near the neckline to help hold up its shape. Utility and decoration are now married with this configuration, showcasing my prized “La Mode” Vintage line of buttons. I had been keeping these two buttons with my B5281 pattern, since the button card says they’re circa 1920 to 1940. They’re quite the statement pieces which were needed here, I think. On that “purely decorative” vein, I took the next step and made loop plackets at the wrist of my sleeves to match the neckline. The pattern called for two small zippers and I want to do this feature to a dress or top at some point, but not on this project. Matching my neckline buttons made finding some smaller wrist closure buttons a slight challenge which hubby and I conquered together. My wrist closure was sewn in a manner I learned from doing the sleeves of this project, and its something I’m quite proud of how it looks and turned out. You simply do a small hem along the sleeve end and turn the hem up, right sides together, so it’s aligned with the opening. Then, I slipped my loops in the seam of one side and sewed both corners together. Trim seams and turn them right sides out and just like magic I had a perfectly finished hem cuff. I hope my picture reveals some light on my technique. The sleeves had been on the edge of needing some extra ease to allow for some “reach room”. After a few wearings, I was tired of being restricted to merely sitting pretty and having trouble even so much as adjusting my hair, so I gained the gumption to add a professional sleeve gusset and adapt the fit. First, I slashed and spread open the sleeve caps, doing the traditional large arm adjustment. Then I cut the sleeves out on the bias of the fabric, as this gives them much more ‘give’ merely from the shifting adjustability of cross-grain cuts. I also made a simple extended triangular gusset to give me some extra added room to move. These changes made my sleeve look like a 1940s era sleeve I am used to rather than the skinny sleeves on the reprint. Finally, I made a very simple hem to the wrists of the sleeves. I know, I know…I spent all that time to make the button wrist closures on the original sleeves. However, I just wanted a sleeve that fit well more than I wanted a fancy sleeve for the second time around. The zipper here is probably one of my best installations, even with the tricky gathers along the side. This is probably because I came back to unpick the machine stitching and sew a hand stitched zipper installation. Hand sewing this tricky area is really the best way for a tight and precise zipper. Those side gathers are such a small detail to add in there, but they perfectly compliment the rest of the dress. To be honest, at first I really didn’t like the dress on myself that much. I thought it looks more obviously vintage than many of my other past era patterns and the bright red is like a punch in the eyes. However, in this deep red color and expensive fabric, it does have a very classic, professional, suit-type of aura unlike anything in my closet. Once I wore my new dress, I absolutely loved it. The skirt portion hangs beautifully and the L-panel which goes across the tummy and hangs down is the best compliment ever for a woman’s waistline. I am going to enjoy wearing my 3rd dress from 1946 ( #1 dress here, and #2 dress here). 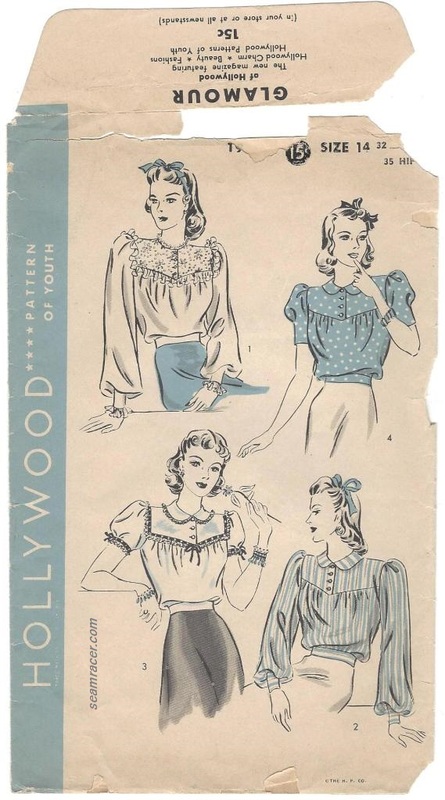 Hmmm…maybe 1946 is a good year to pick patterns from for more upcoming vintage projects. When I tell people about this 1946 dress, everyone replies that they can’t wear wool because its too itchy of a fabric. Goodness! It’s a shame the general populace has NO idea what quality wool, or wool blends really feel like – otherwise I suppose I would not get those sort of replies. I do have sensitive skin and this fine wool gabardine used for my dress is not obviously itchy, just soft and smooth. A recent purchase of a wool/silk blend fabric from Mood N.Y. has further impressed me with the softness that quality wool fabrics can present. 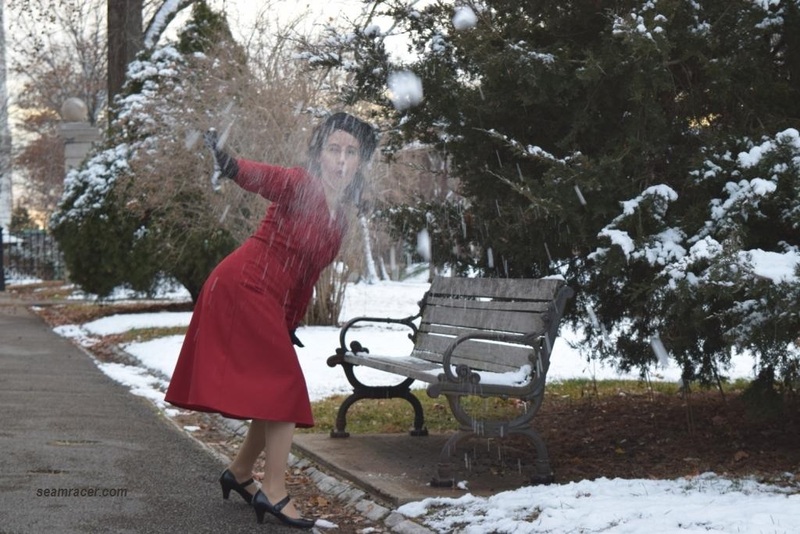 My hope is to convince people, when I wear my 1946 red wool dress, to see what they are missing as a consumer by realizing the nice quality fabrics that RTW store clothes are cheating them from enjoying. It’s that time of year to see all sorts of things proudly showing off our country’s colors, and I will be no exception. 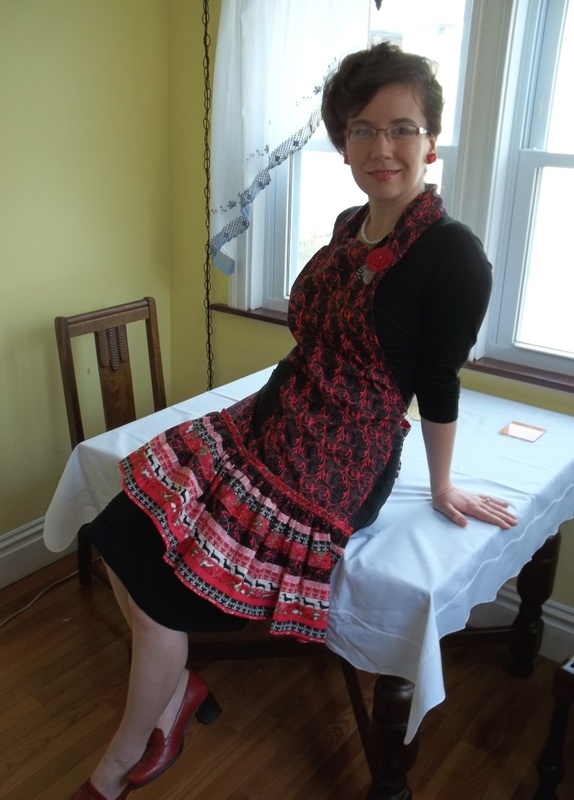 A new dress can’t get any more fun than going all out in a full circle skirt, contrast lining to highlight my “burnout” designed knit, and bold red color to boot. 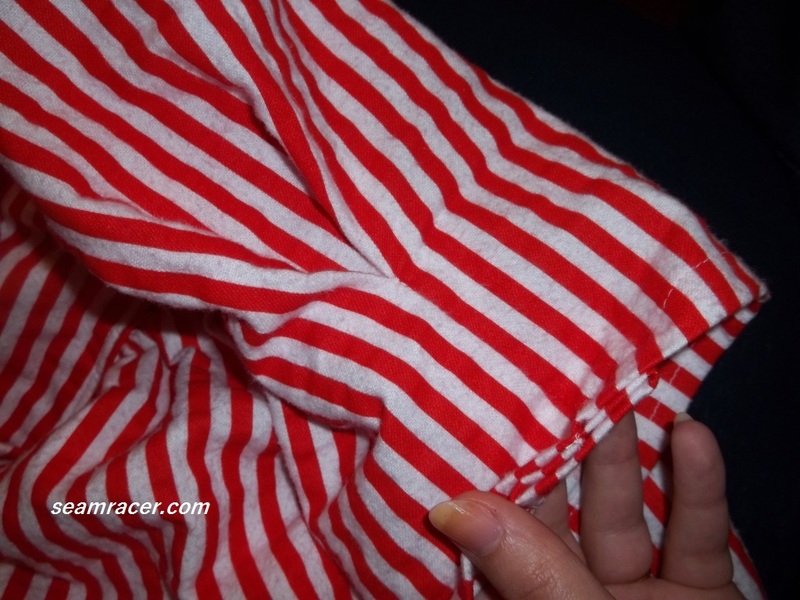 THE INSIDES: all seams, excepting the armhole seams and bottom hem, are finished in French seams. The French seams got a little bulky, especially around the waist seam, but some top stitching (done sparingly) helped matters. Hem tape was used on the back half of the bottom hem, merely because I cut that piece an inch shorter from the front…I always find a way to fix any of my boo-boos! In the picture below you can see my hem tape/normal hem. My skirt is so full, hopefully my hem is all that I’m showing off! 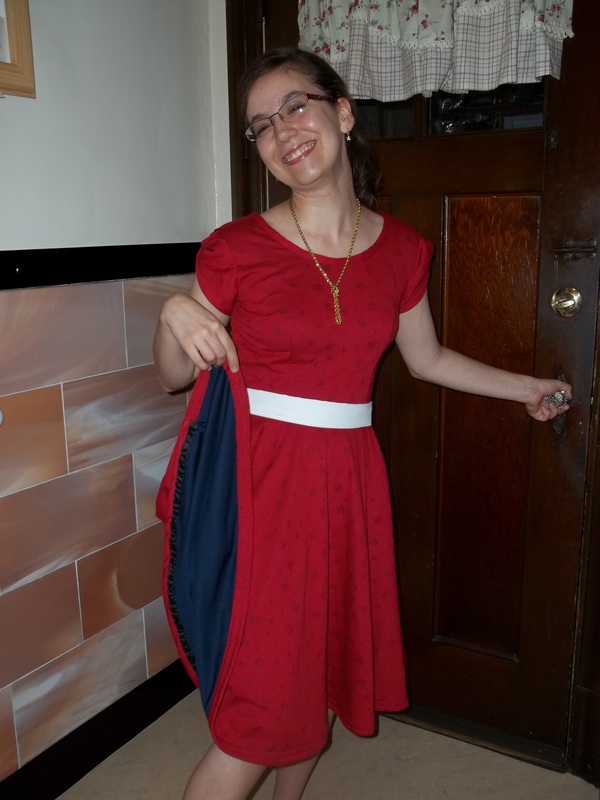 TIME TO COMPLETE: I finished this dress on June 5, 2013, after an estimated 6 hours of sewing. I first wore my dress out to a beauty salon for a haircut and style, and really felt GOOD that evening all spiffed up! I definitely thought outside the box for making this project, but my mind seems to naturally think of ways to stretch boundaries. 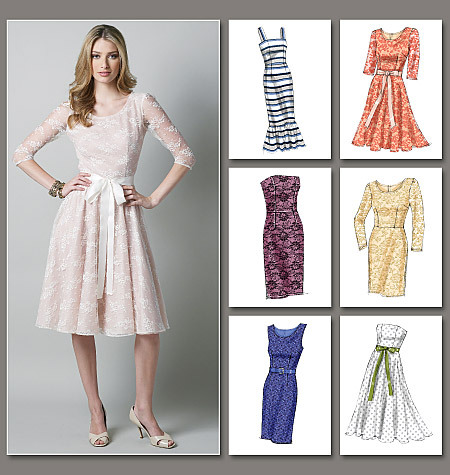 Vogue 8766’s recommended fabrics only mention lace and everything else I consider “nice wear”. Not that I don’t like fancy fabrics – I really love them, but wanted to enjoy this pattern’s designs out at a barbecue or casual affair as well. Why shouldn’t I be able to accommodate for a knit using V8766, by going down a size? 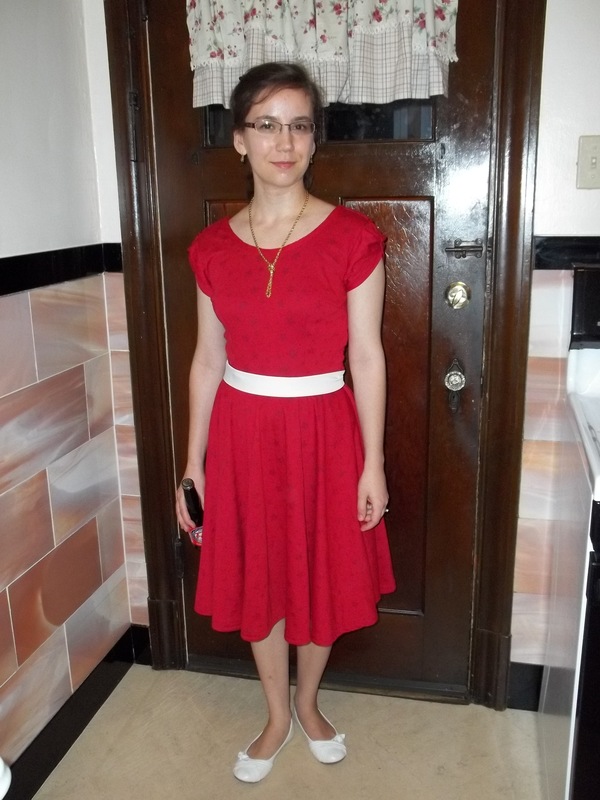 My idea was correct, as it has been before for other patterns, such as my Vintage Vogue 2859. I was set on using this pattern for my red fabric because the star print is so busy I wanted it to ‘shine’ by having styling that would be both simple and beautifully fun. 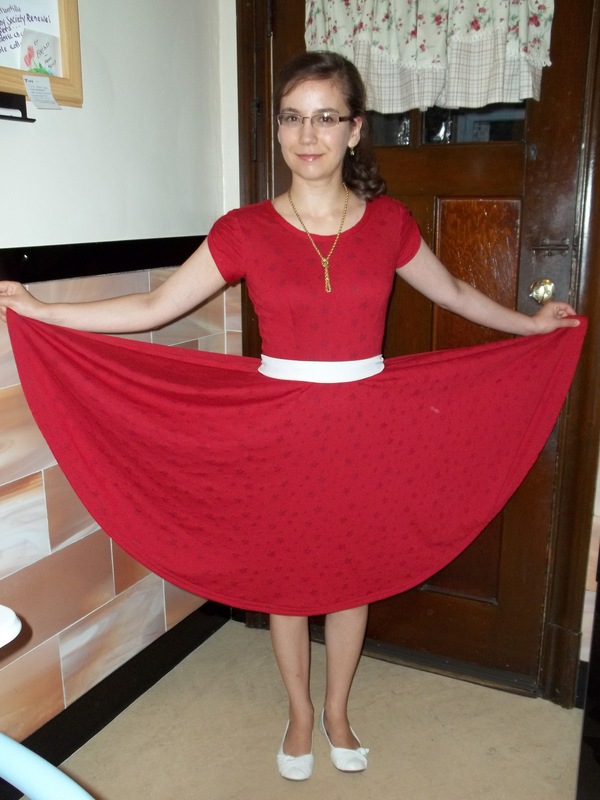 Besides, after all the sewing I have done I was dying for my first full, mega twirl circle skirt dress. Looking at the envelope back compared to the amount of fabric I had showed a n intimidating discrepancy. I am proud to say my stubbornness paid off here and, after shortening the skirt pieces and the sleeves, I squeezed in every pattern piece without skimping on grain line or sizes. There were literally four or so small 3 inch pieces left over as scrap. I know MY limits, but don’t recommend this ‘tight squeeze’ practice for anyone. The red burnout knit is lined in the lightest weight knit I could find. I think it is actually an “sport/active wear” knit with little perforations in the one side. I bought several extra yards for lining a sweater knit dress I hope to make in winter. I love my neckline alteration of sewing on a smooth bias band to cover and finish off the entire neckline. The pattern’s way of doing the neckline was just as fine but I find myself really prefering the invisible stitches of my own self-fabric bias facing. Another major change to the construction of the dress was eliminating the zipper. Using a knit really made a zipper unnecessary, so I sewed up all the center back seams. Just in case I should have any trouble getting the dress on, I was planning on leaving the top of the seam open about 6 inches and merely doing a button & loop closure to add utility as well as visual interest. Hubby improved upon my button opening idea when he saw me try on the finished dress (I saved sewing the buttons for last). The back looked like it does in the picture above of me making some of my home cooking. “I like it just like that…leave it as it is” he told me. Looking at the back from a different point of view, I liked it too, and tacked the corners down. I have received the most comments and compliments regarding the open back of my dress. 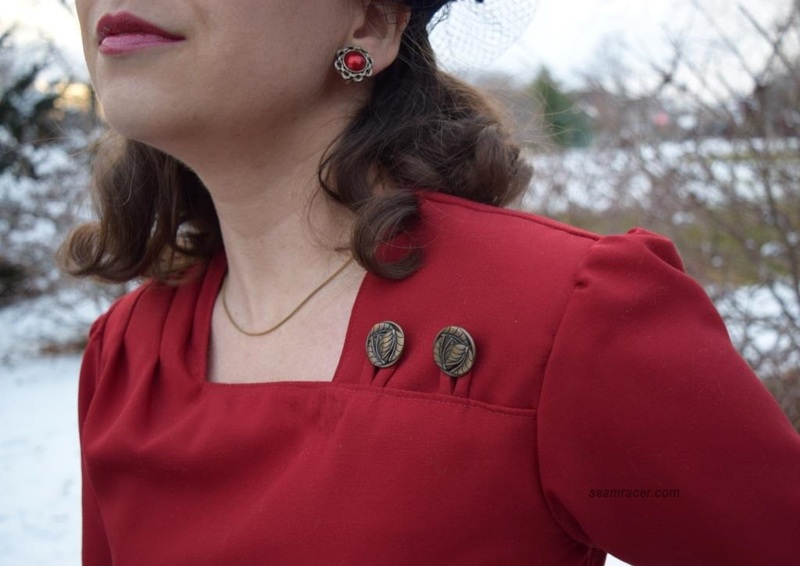 The lay-open collar style back feature I added to my red dress actually reminds me of a style trend from the early 1930’s. 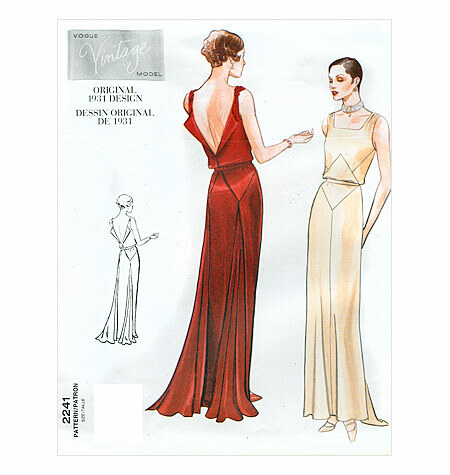 As seen in the Vintage Vogue at left, which I sadly do not have in my own pattern stash, the 1931 evening gown has the exact same open collar back, and it’s in red too! My gut reaction says that I am linking a 30’s design feature to my modern dress because of how I love sewing so much vintage items. However, I also love noting the history of fashion and design, so I enjoy helping people see that vintage never really goes out of style. All past ideas are built upon and re-used to create the fashion we have today. Look around in a RTW store and you are probably seeing some design features, however small, ranging from the past 90 years. In honor of my 30’s open-collared back, I wore a 20’s/30’s “lariat/lasso” style gold necklace. 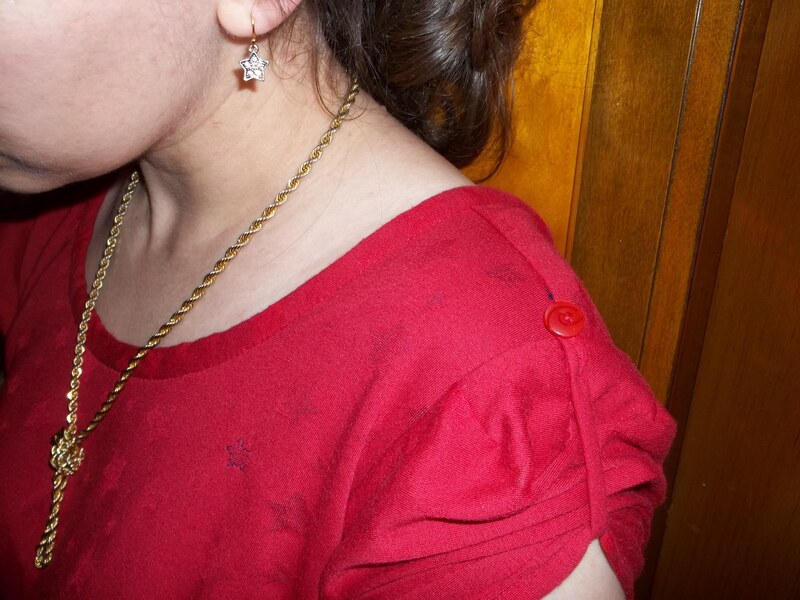 I even made my own earrings to match the stars in my dress – there had been two gold jewel studded star charms I found in my beading/jewelry containers. I hope you can see my accessories in the picture below. For some reason, I just did not like the look of the plain short sleeves, but I knew sleeveless would not look good either. Luckily my small leftover scraps were still big enough to cut out and made two cords for pulling up the short sleeves. There is a fancy swirled button at the top were the cords were sewn down. As the final touch, I picked one of the stars on the left side of my upper chest and outlined it by sewing navy thread around it. If you look hard in the picture, you might be able to see it. 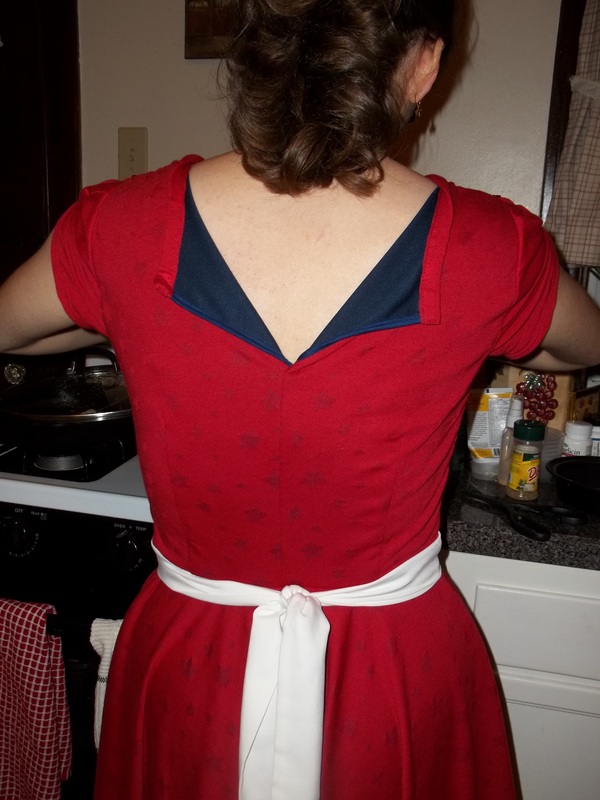 My star-spangled red dress was the easiest sewing I have done in a while, and that was a welcome treat and pick-me-up that I needed at the time. Everything about my red dress came together effortlessly while fitting well. If this dress was any easier it would make itself (not really, but almost). I will definitely be making this again, in lace or a brocade. 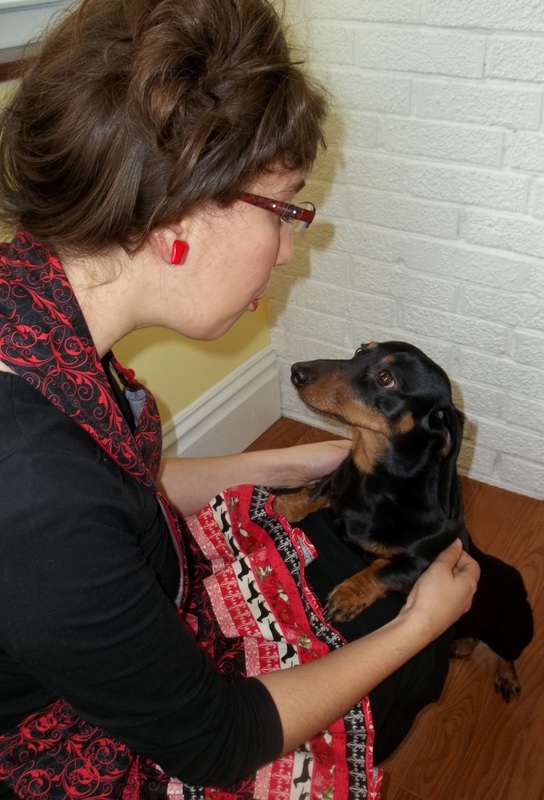 Both my dress and its pattern are easy favorites for a gal’s wardrobe. 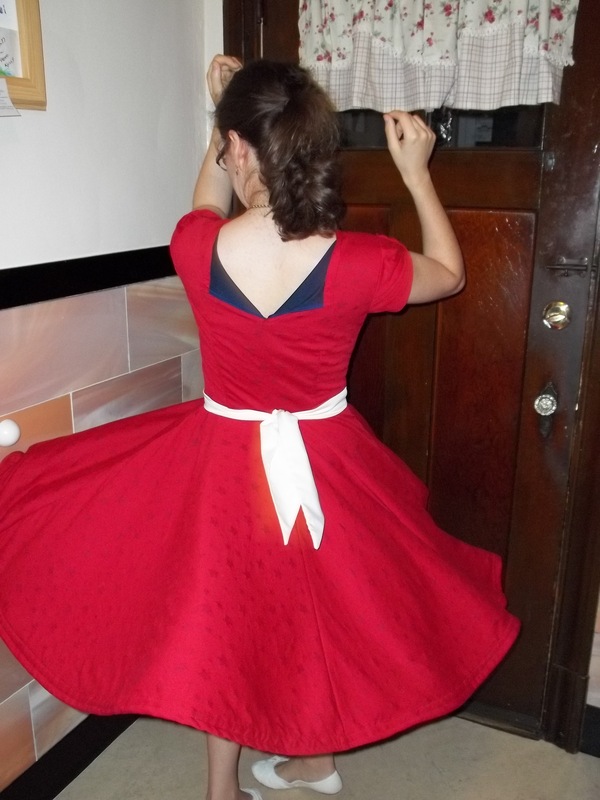 I have to show a twirling photo – it’s a fun necessity here! The one side is my ‘regular’ look, skirt at rest (and a root beer in hand). The other side is my ‘in action’ look, in full twirl, maybe with music rolling in my head. Taylor Swift’s song “Red” might be appropriate.